When the news of the first finds of gold in 1859 in what is today the city of Denver reached back east, the great rush to the Rockies was on. As all anyone at the time knew about the Rocky Mountains was "Pikes Peak," the slogan "Pikes Peak or Bust" was painted on some of the gold seekers' wagons, although where they were headed was some 100 miles north of Pikes Peak. The great Colorado mining boom that followed was the major reason for the building of narrow gauge lines into the Rockies. There were rich rewards awaiting the railroads’ founders in hauling people and supplies into, and people, live stock and mine ores out of the Rockies. 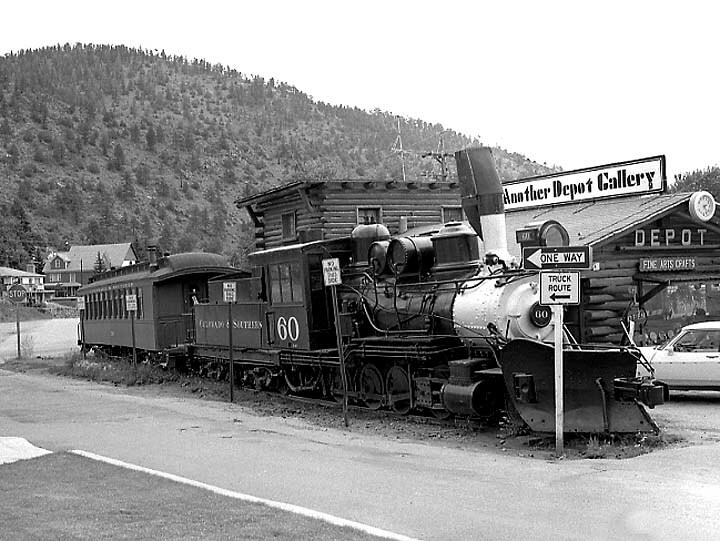 By the late 19th Century into the early 20th, the Denver & Rio Grande; Silverton Railroad: Silverton Northern; Silverton, Gladstone & Northerly; Rio Grande Southern; Denver, South Park & Pacific; Colorado Central; Florence & Cripple Creek; Colorado & Northwestern; Greeley, Salt Lake & Pacific; Denver Boulder & Western; and other narrow gauge lines had in place a large network of narrow gauge rails throughout the Rockies, serving mining districts around Silverton, Red Mountain Pass, Creede, Rico, Ophir and Telluride in the San Juan Mountains of southwest Colorado; the South Park region of the central Rockies; the silver mining boom town of Leadville; the Clear Creek districts including Georgetown and Silver Plume, Central City and Blackhawk (billed as "The Richest Square Mile on Earth”); the famous Cripple Creek and Victor district (known as “The World’s Greatest Gold Camp,” “The City of Mines” and “The Bowl of Gold”); and the mines west of Boulder around Ward, Eldora, Sugarloaf, Gold Hill and other camps on trackage known as the "Switzerland Trail of America." SILVERTON RAILROAD Silverton, isolated deep in the heart of the San Juan Mountains deep in the Animas River Canyon in Bakers Park and reached by the Denver & Rio Grande in 1882, was to be the final terminus of the D&RG’s westward extension, for the San Juan mining boom of the late 1800’s was tapering off. But three other railroads would continue on past Silverton to reach many of the mining camps and towns near-by: Between 1899 and 1918 the Silverton, Gladstone and Northerly ran north 7 1/2 miles to the small mining camp of Gladstone; the Silverton Northern continued up the Animas River Valley to the mining town of Animas Forks; and the Silverton RR ran north to the Red Mountain Mining District. Between 1887 and 1924, the tail of the Silverton wye originally extended further north as the main line of the Silverton Railroad for 18 miles to the small mining town of Albany. 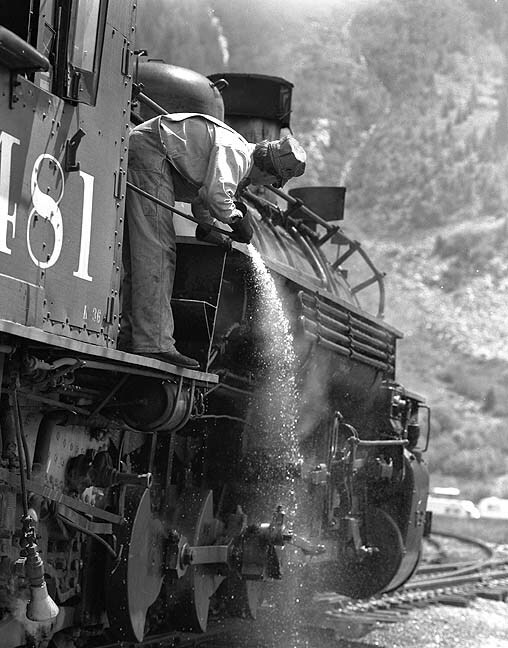 Here, Durango & Silverton fireman John Coker takes the opportunity to hose down his engine while waiting on the tail of the wye. In the early 1880s, several towns sprang up in the Red Mountain District, catering to the area miners with supplies, saloons and residences: Chattanooga; Red Mountain Town (or Hudson Town); Red Mountain City; Rogerville; Guston; and Ironton (left). 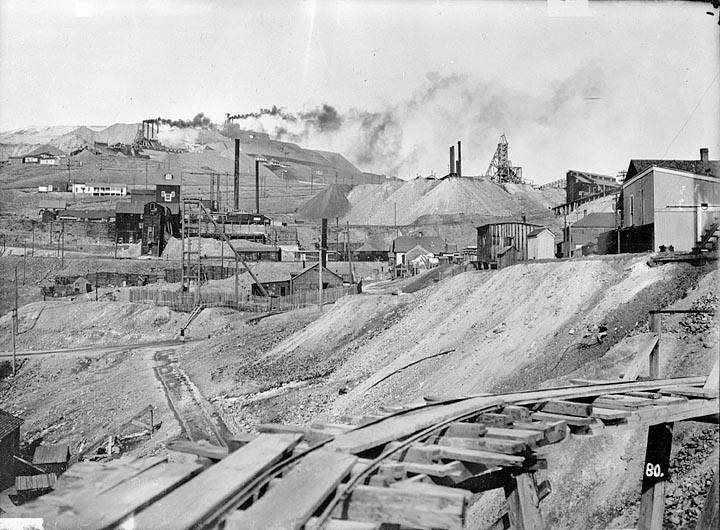 In 1889, the Silverton Railroad reached Ironton and the town quickly became the major supply point for the Red Mountain District, with numerous businesses and a population of over 1,000, mostly miners in the near-by mines. Two tains a day stopped in Ironton. But by the end of 1898 Ironton's post office had closed, although mining continued in the area late into the 20th century and there were still a few residents in the 1960s. Today the site of old Ironton is very easy to find, just below HY 550 north of Red Mountain Pass. The old railroad grade can still be seen running past the handful of remaining houses, which are under the care of the Colorado Historical Society. Just outside Ironton, the Silver Belle Mine (above right) is visible from HY 550. 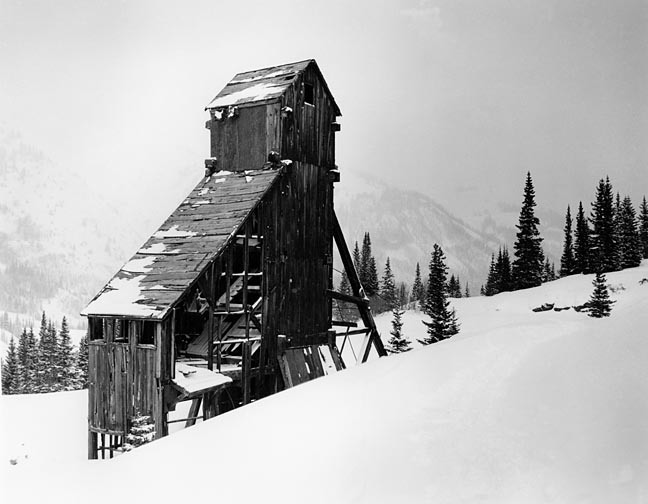 The Red Mountain District north of Silverton was home to countless mines, but some of the major producers included the Guston-Robinson, the Yankee Girl, and the Genessee-Vanderbilt. Of these, the Yankee Girl was the greatest, in its 16 years of operation producing over $12 million in ore, equivalent to 21st Cenruty values in the tens of billions! The Silver Ledge below HY 550 outside Chattanooga was another major mine in the Red Mountain District. The small structure in the background is the privy, which dumped over the side of the cliff wall directly into the creek below. Obviously, the was before OSHA! 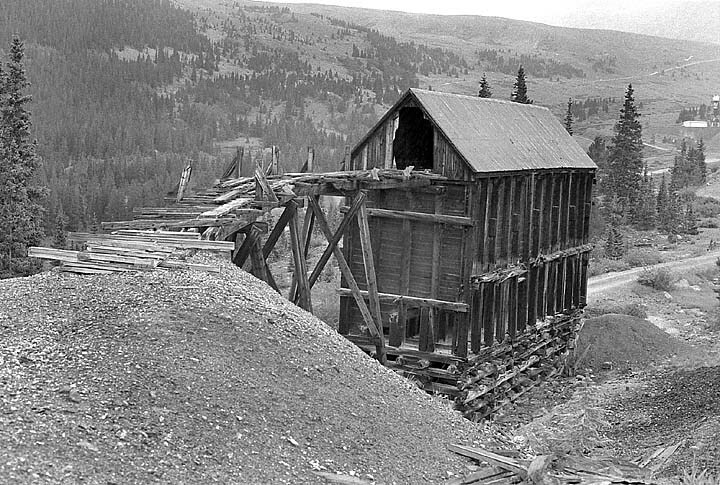 Between 1896 and 1942, the Silverton Northern RR continued 13 miles northeast from Silverton to the mines around Animas Forks in the upper reaches of the Animas River Canyon near the head waters of the Rio de Las Animas de Perdidas, the “River of Lost Souls,” from which location the old mining town takes its name. Today several old buildings still stand in a high mountain meadow. 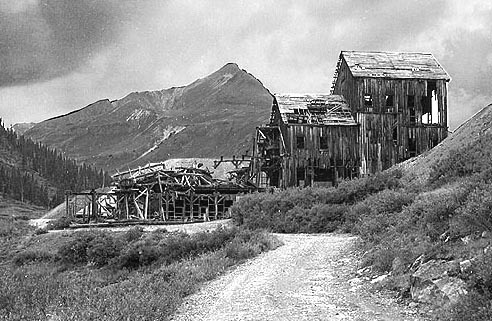 Animas Forks had two smelter and reduction works which served over 15 area mines. 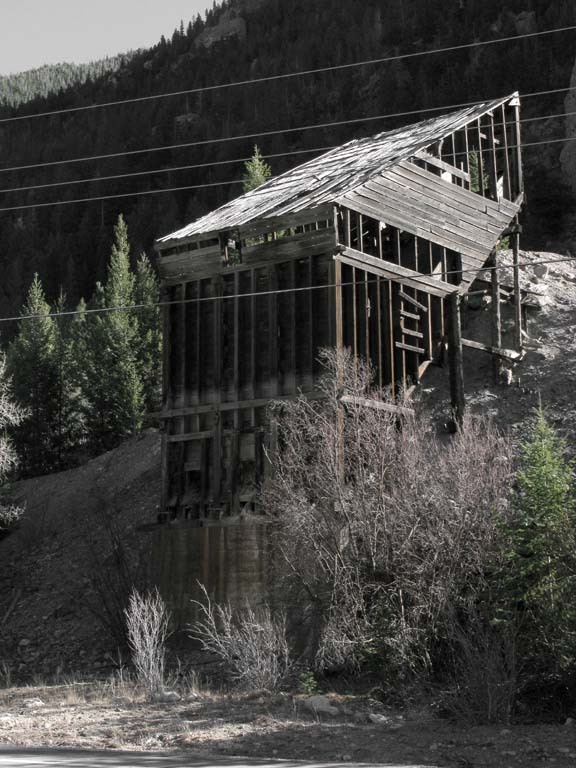 As you drive into the old town from Silverton, the concrete foundations of the huge Gold Prince Mill can be seen. 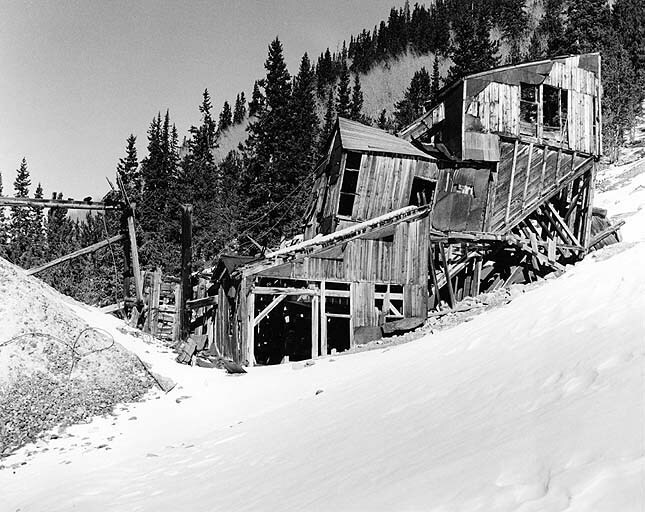 Built in 1904, the Gold Prince briefly revived mining in the area until it closed in 1910, and was the last operating mill in Animas Forks. 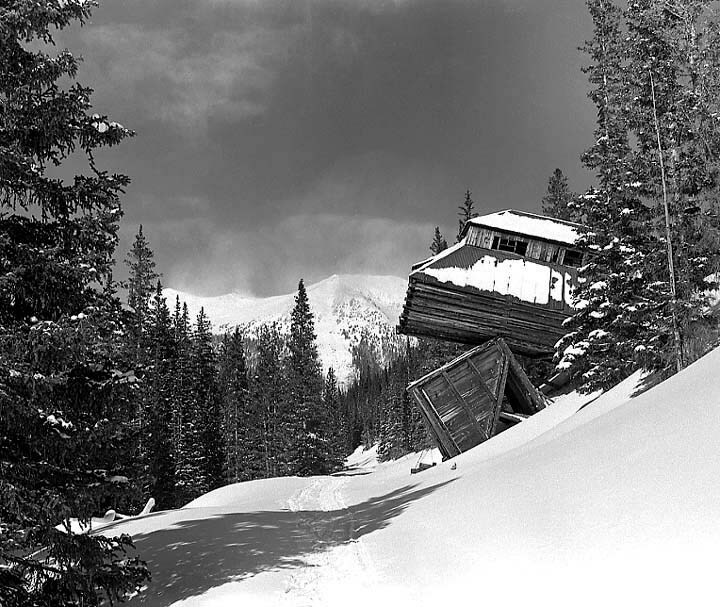 The population quickly swelled to over 1,500 hardy souls for at an altitude over 11,000 feet, winters were harsh with snows over 20 feet deep, and the town was also hit by several avalanches. But the town had that “new fangled” telephone, when a line was strung over the mountains from Lake City (to the east) in the 1880s. 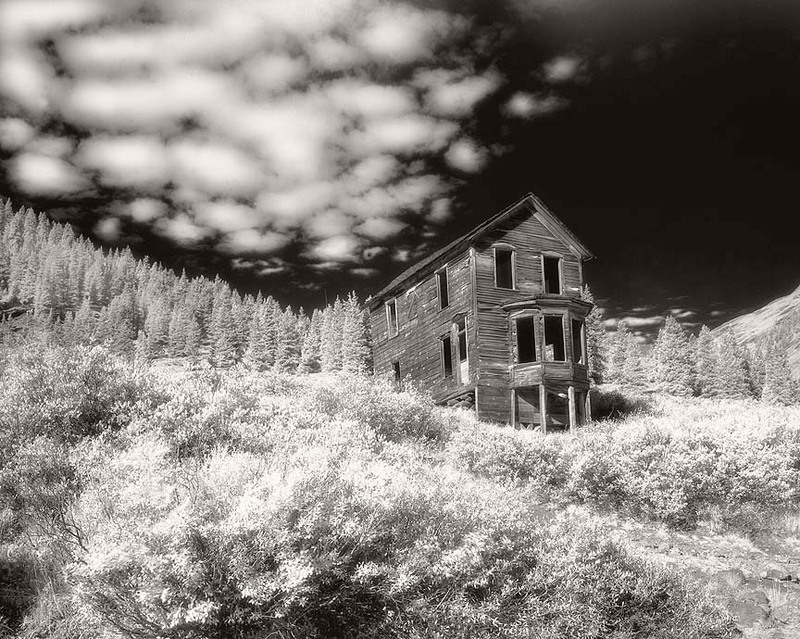 Most of Animas Forks was deserted by the 1920s, although some mining activity continued into the 1930s. The rail line was torn out in 1942. 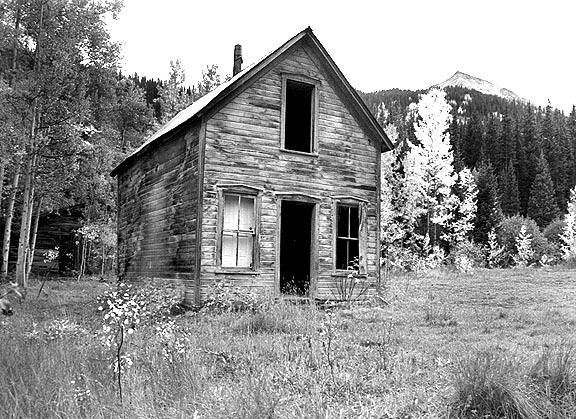 Perhaps the most photogenic - and famous - structure in Animas Forks is the "Duncan House" with the bay window seen here, said to have been the one time home of Evelyn Walsh McLean, daughter of millionaire mining man Thomas Walsh (owner of the famous Campbird Mine near Ouray), and an owner of the famous Hope Diamond. 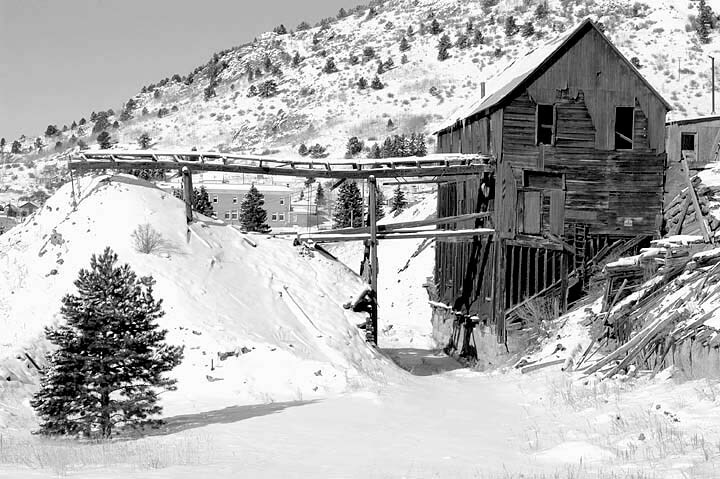 The mill of the Columbus mine (left), started in early 1880's and last worked in 1939; and 1/2 mile up California Gulch past Animas Forks stands the large Frisco Mill (right) which served the Bagley Tunnel, started in 1905, behind the upper level of the mill. 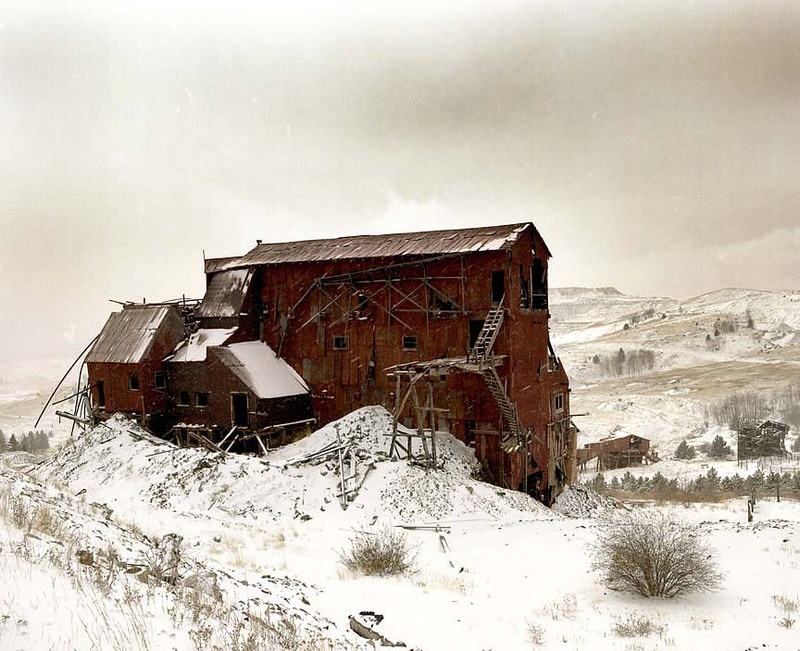 The wood for the Frisco mill was cut, fitted and coded for assembly at the San Juan Lumber Yard and then brought up to Animas Forks on the Silverton Northern, then by wagon the last 1/2 mile to be re-assembled around the milling equipment. Even today, the letters and numbers which were used as codes for re-assembly of the mill are plainly evident on the interior beams and supports. 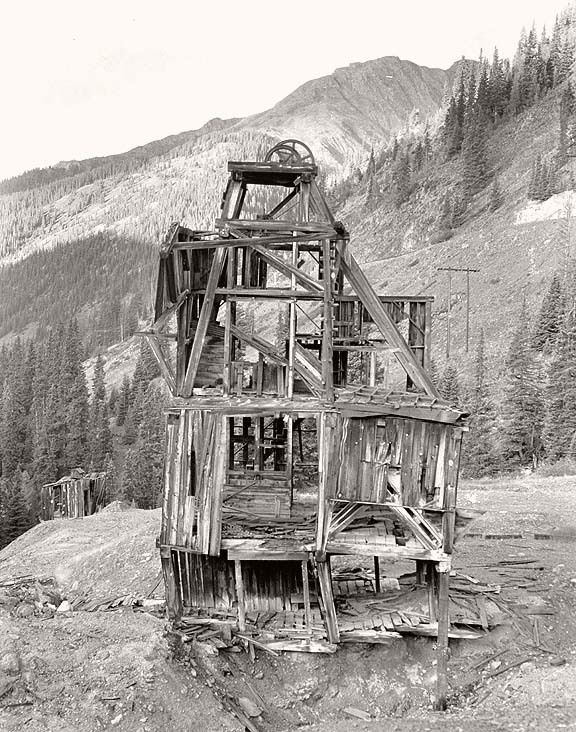 Today the Old Hundred Mine (named for a Gospel Hymn by a Maine company which developed the mine) which was served by the Silverton Northern offers tours of its gold mine near Howardsville outside Silverton. In the mid-1920s the Silverton Northern rail bus “Casey Jones" was built by employees of the Sunnyside Mine in Eureka, eight miles northeast of Silverton, for use as an ambulance to get those in need of a doctor down to Silverton. It also was used by members of the Masonic Lodge to travel to meetings. 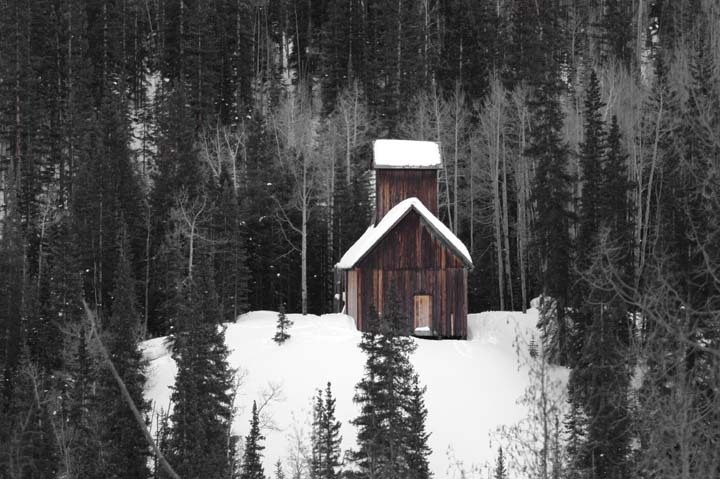 The Silverton Northern was abandoned in 1942, but sections of the old Silverton Northern grade can still be found in the upper reaches of the Animas River Canyon north of Silverton. And Casey Jones today is in the care of the San Juan County Historical Society which keeps it on display in Silverton during the summer months. Despite its years of exposure to the sometimes harsh elements in old Silverton, it has remained in excellent original condition, including its 1917 Cadillac V-8 engine, which still runs! Recently, the little bus was brought back to life and has run at some of the annual Durango & Silverton Railfest events each August. The Durango & Silverton still runs narrow gauge trains to old Silverton. Here, #476 with a work train at the edge of town heading south into the Animas River Canyon presents a look that is probably similar to a train of mine ores. And this mine structure is one of many in the area. The Rio Grande Southern RR served mines to the west of Durango that the Denver & Rio Grande did not build to, including mines near Rico and Telluride. 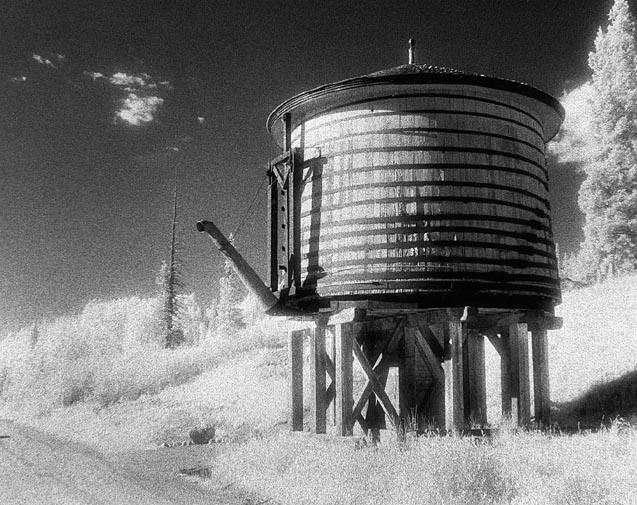 The RGS Trout Lake water tank still stands beside the old grade looping around the lake between Ophir and Rico. And RGS #20 and a coach is at the Colorado Railroad Museum in Golden. GREELEY, SALT LAKE & PACIFIC / COLORADO & NORTHWESTERN / DENVER, BOULDER & WESTERN From the late 1800s to 1920, the rail route that came to be known as the Switzerland Trail of America running west from Boulder (with 3-rail connection into Denver) served the mining areas around Nederland, Eldora, Gold Hill, Sunset and Ward. Originally built in 1883 by the Greeley, Salt Lake and Pacific RW which went bankrupt after a flood destroyed the tracks, the Colorado and Northwestern RR took over in 1896 and gave the line the name of “Switzerland Trail” to lure the tourist business. Finally, beginning in 1909 the Denver, Boulder, and Western RR operated the line until closing mines and competition from new roads led to the railroad’s abandonment in 1919. Locomotive #30, an 1898 Brooks Locomotive Works 2-8-0, served the gold mines around Nederland, Eldora, Gold Hill, Sunset and Ward on first the Colorado & Northwestern and later the Denver, Boulder & Western. With the demise of the DB&W, #30 saw service as #74 on other mining railroads: the Colorado & Southern's former Denver South Park & Pacific / Denver Leadville & Gulf lines in the South Park and Leadville areas until 1938; then on the Rio Grande Southern. After the RGS’ abandonment in 1952, the locomotive was renamed back to DB&W #30 and, along with a coach and caboose, put on display in Boulder’s Central Park. In 2012, #30 and train were moved to the Colorado Railroad Museum for display and temporary storage. 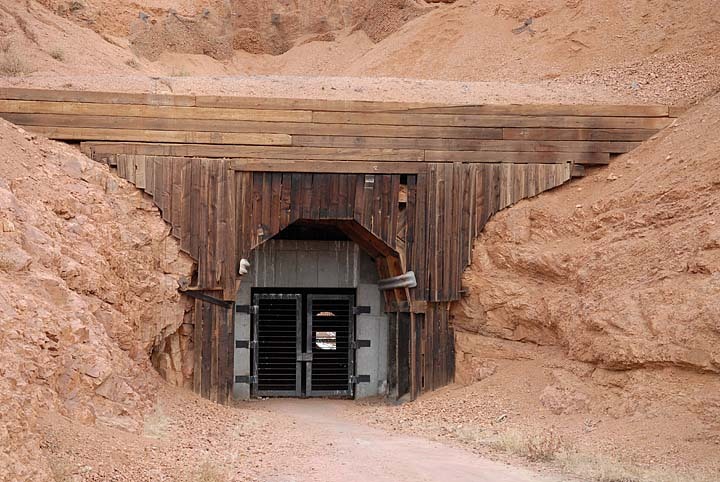 This old mine ore chute is alongside the highway between Nederland and Ward. And the Ward depot still stands beside the old grade of the Colorado & Northwestern / Denver, Boulder & Western. 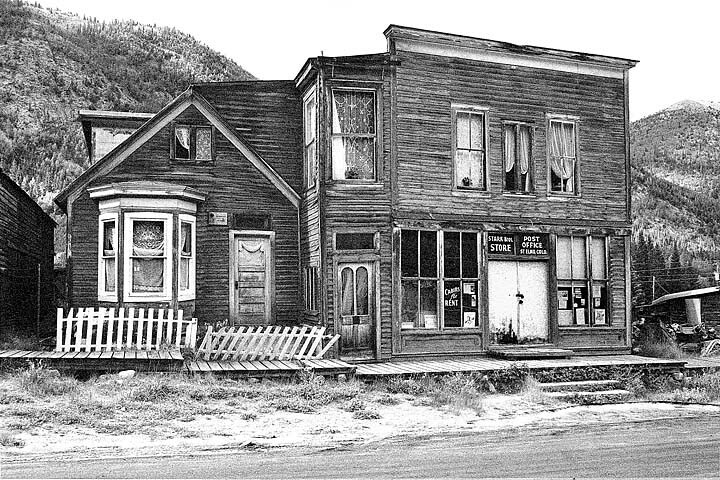 The many mining camps that sprang up in Gregory Gulch soon grew into the towns of Black Hawk and Central City, the center of a fabulously rich mining district that would come to be called “The Richest Square Mile on Earth” and “The Little Kingdom of Gilpin” (after 1876 statehood, this area became Gilpin County). 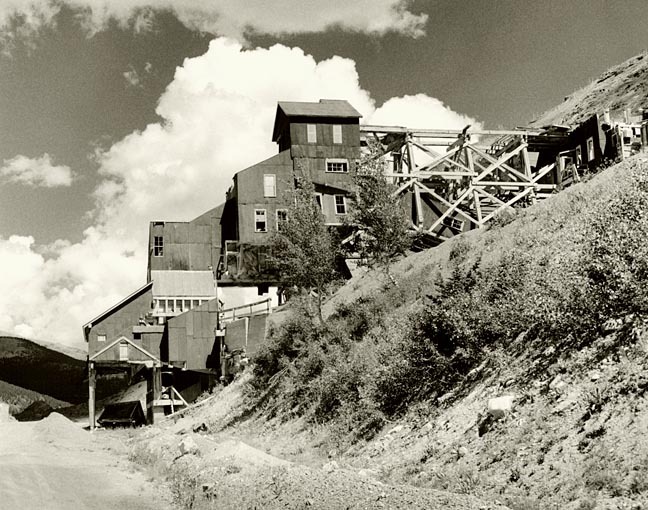 Through 1959, the district produced about 6,300,000 troy ounces of gold, about 9 1/2 billion dollars in today’s market. The Colorado Central railroad reached Black Hawk along the north fork of Clear Creek in late 1872 and, after a delay in further construction, Central City in May, 1878. But like all mining districts, the production and the population dwindled, and by 1931 the railroad, which had become the Colorado & Southern in 1899, was also gone. Today, Black Hawk and Central City are mining the gold from the pockets of weekend warriors up from Denver with a plethora of gambling parlors and casinos. 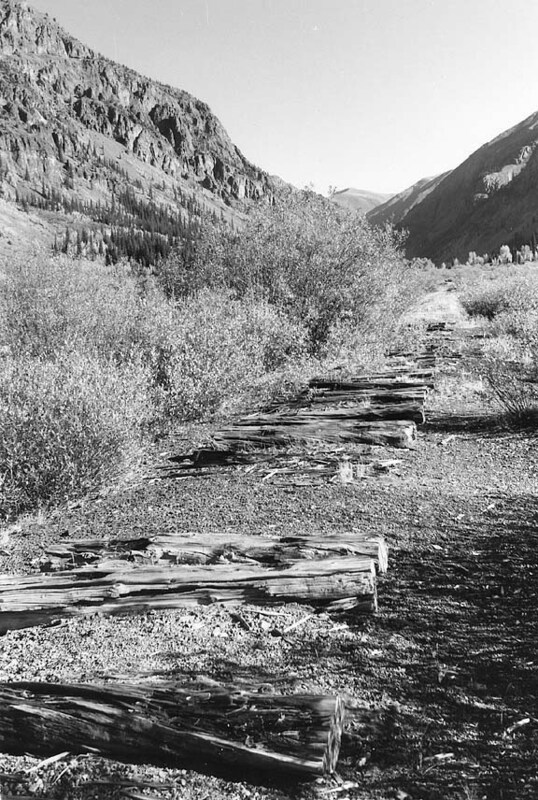 In 1987 the Black Hawk & Central City Narrow Gauge RR tourist line rebuilt a portion of the old Colorado & Southern grade in Central City, abandoned by the C&S in 1931. 1896 C&S Baldwin 2-8-0 #71, leased from the Gilpin County Historical Society, needed only minor restoration work to return to service. But the new line was not a success, and the rails were pulled out again after two years. Today #71, along with dark green combine C&S #20 lettered Adams Express CO. is on display at the edge of Central City beside the Reserve Casino, across from the corner of Gregory and D Streets. A fake #71, although a real 1898 2-8-0 Baldwin, is on display beside HY 119 in Black Hawk. Many mine tailings and crumbling mine buildings still dot the hills around the two towns. The Colorado Central / Colorado & Southern did not run to all of the area mines, but was connected to many by a 2-foot gauge line, the Gilpin Tram. Although Black Hawk has changed greatly with the coming of gambling, old Central City looks pretty much the same today as it did in the mining boom times. COLORADO CENTRAL / COLORADO & SOUTHERN Georgetown (the “Silver Queen of the Rockies”) was founded in 1859 during the same “Pike’s Peak Gold Rush” to the Black Hawk / Central City area, by prospectors George and David Griffith. Although the hundreds of mines that soon dotted the area produced gold, silver was also a major find. 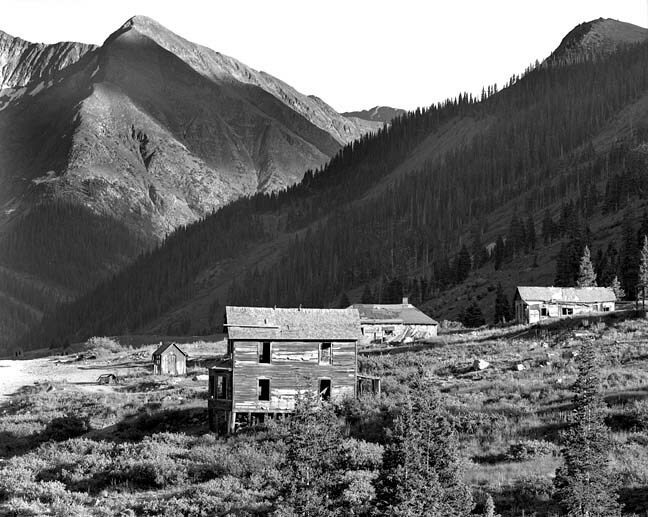 After reaching Black Hawk, other mining camps in the valley of the south fork of Clear Creek including Georgetown and Silver Plume became the second goal of the Colorado Central. 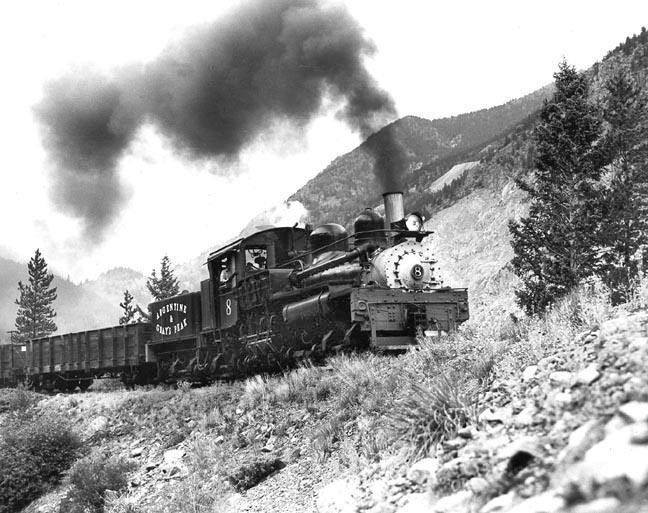 The railroad reached Georgetown in 1877 and pushed on to Silver Plume (named for the Silver Plume Mine, account its feathery streaks of silver) 2 1/2 miles further west, in 1884. But to reach Silver Plume from Georgetown, although a distance of a mere 2 1/2 miles, there was a rise in elevation of 638 ft. that would have required a 6% grade for a direct route. To overcome this impossibility, a curving, 4 1/2 mile route was laid out that looped around to climb both sides of the valley wall, crossing Clear Creek four times in less than a mile with a maximum grade of 3 1/2%. 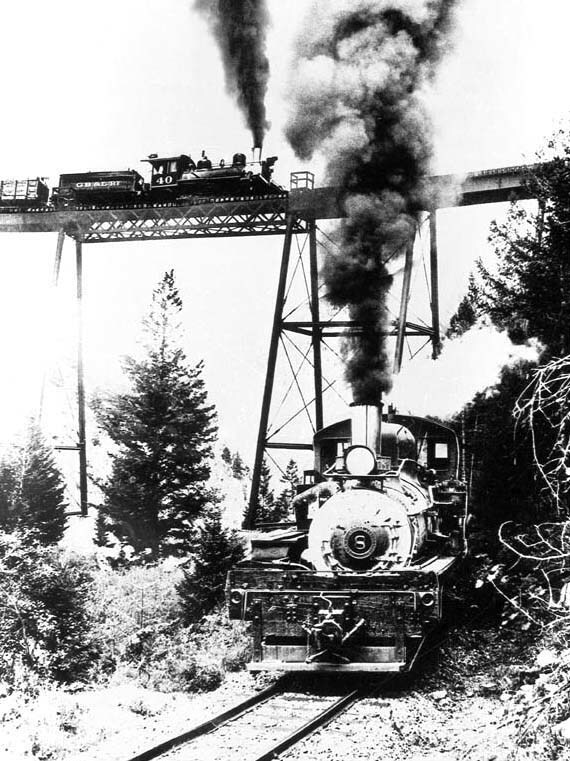 The track crossed over itself on a 295 foot long spindly looking trestle called the “Devil's Gate Viaduct" 100 feet above Clear Creek and the tracks below. After the mining boom dwindled, this section of the railroad became a popular destination for excursionists up from Denver to travel “over the Loop.” But with the coming of paved roads, even this business was no more, and the Loop trestle was dismantled in 1939 and all of the railroad was gone from Clear Creek two years later. Reconstructed between Georgetown and Silver Plume by the Colorado Historical Society in 1984, today, the Georgetown Loop RR carries only passengers but still serves a mine along the line, with tourists deboarding for the underground Lebanon Mine tour. Trains also pass the siding at the closed Hall Tunnel. Between 1893 and 1910 the 4 1/4 mile Argo tunnel was built between the mining towns of Idaho Springs and Central City to provide water drainage, ventilation and more efficient transportation of the rich ores from the many mines it intersected. 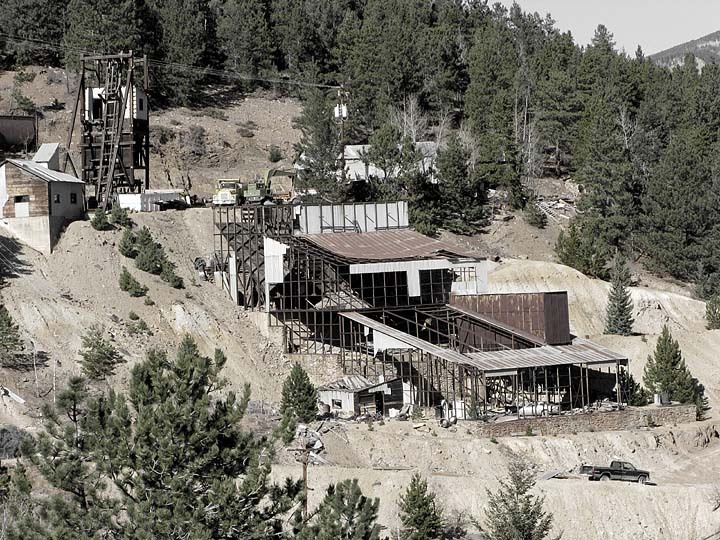 The huge Argo Mill in Idaho Springs was constructed to process these gold bearing ores, which totaled over the years over $100 million of gold. At a value of the time period of $18 to $35 an ounce, that is over 28 million ounces, with computes to a current value (at $1500 an ounce) of over $42 billion. 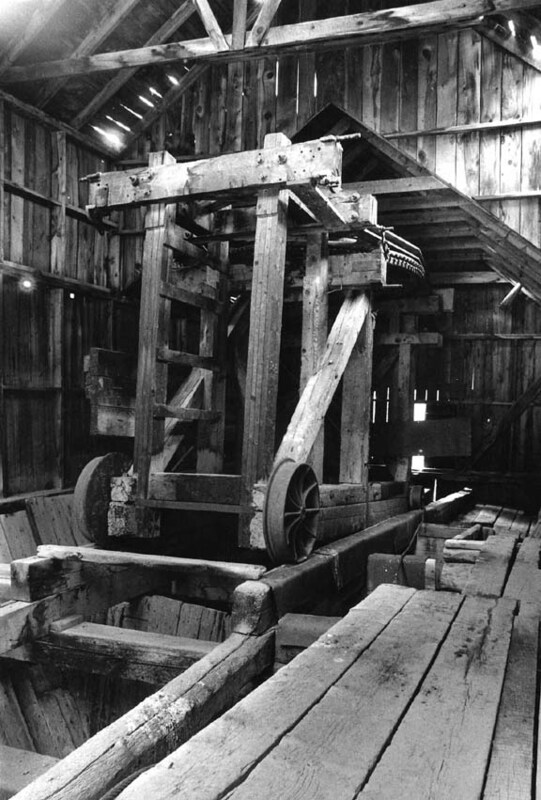 In 1976 the closed mill was re-opened and operates today as a gold mining museum. The Argo was served by the Colorado Central out of Golden, which in 1899 became the Colorado & Southern. The railroad grade ran directly in front of the Argo until abandonment in 1941. 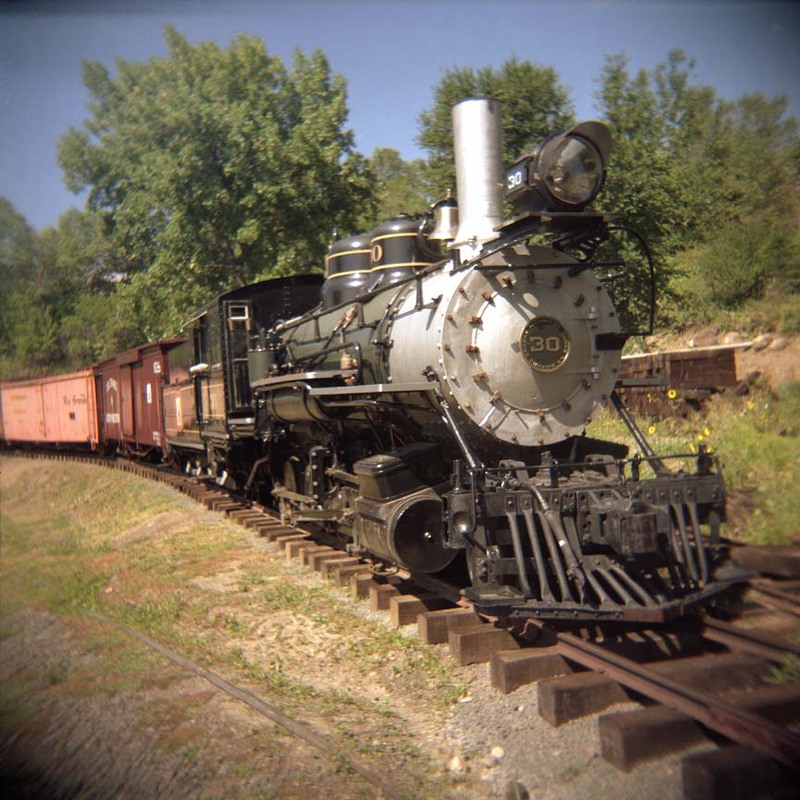 C&S #60, an 1886 Rhode Island 2-8-0, has sat on display on an original section of track in downtown Idaho Springs since the railroad's abandonment in 1941. Seen here in the 1980s, it has since been moved a block west on the old grade from this location and is now in a small public park. 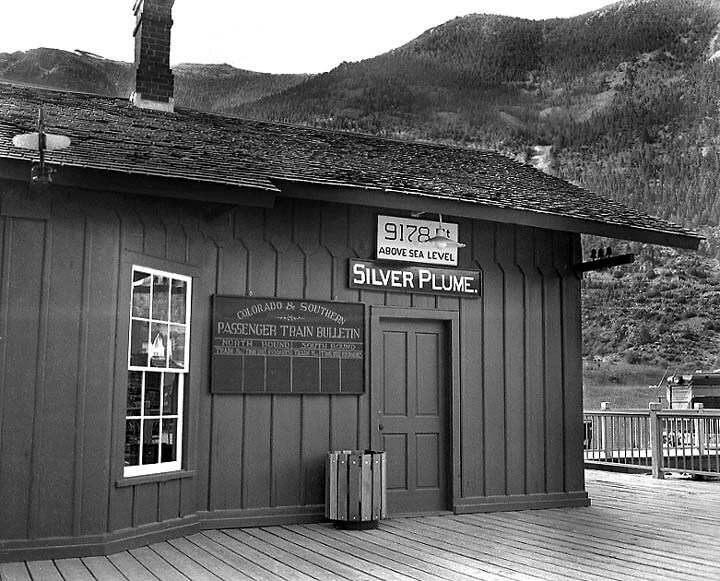 The original Colorado Central station in Silver Plume is still in use by the Georgetown Loop RR. 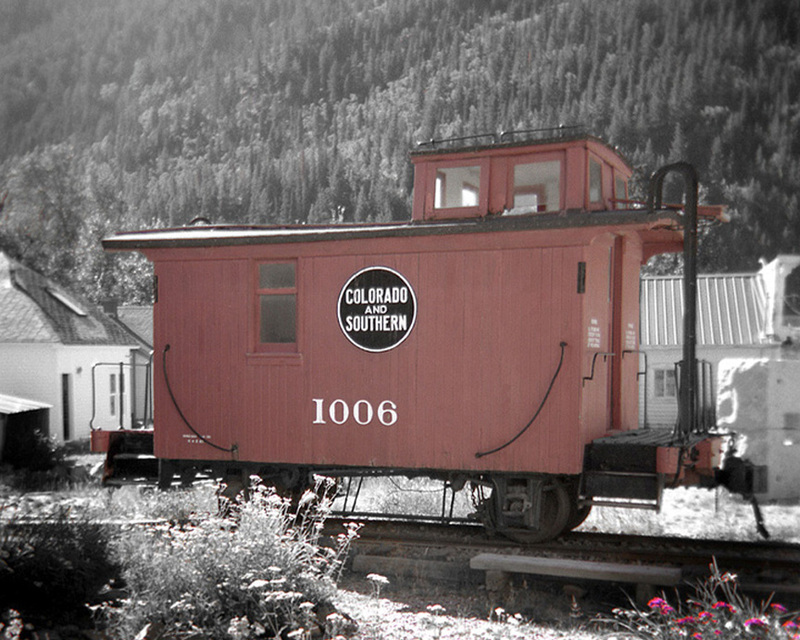 And C&S "Bobber" caboose 1006 (so called account the two wheel trucks made the caboose bob and sway when going down the track) is on display in downtown Silver Plume. These two mines are along the old Colorado Central grade, now the HY 6 frontage road for I-70, beside Clear Creek between Idaho Springs and Georgetown. ARGENTINE CENTRAL Between 1906 and 1920 the narrow gauge Argentine Central ran from Silver Plume up the flanks of Mt. McClellan to the Waldorf Mining and Milling Company just below the Continental Divide above Silver Plume. 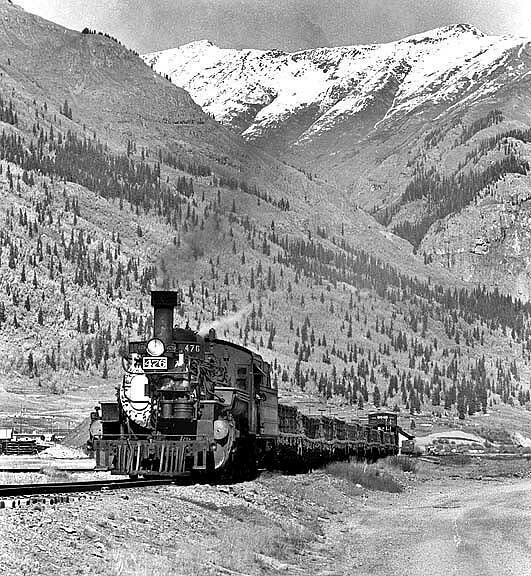 The AC, which took its name from the Argentine Mining District at Waldorf (Argentum is Latin for silver) was extended past Waldorf with plans of eventually crossing the Divide via a tunnel to link up with the Colorado & Southern line into Leadville on the western side of the Divide. The AC also carried tourists who ventured up from Denver on the Colorado & Southern to ride “over the Loop” to connect with the AC for the last thrilling ride up to the Divide. Built with steep grades of up to 6% and a 32° minimum curvature with six switchbacks giving rise to the name "Stairway to the Stars," Shay (geared) locomotives similar to the Georgetown Loop's #8 seen here were used. Nothing remains of old Waldorf today except rotting boards and mine tailings, but it is a nice drive via a 4-wheel drive vehicle up the old grade. FLORENCE & CRIPPLE CREEK / GOLDEN CIRCLE RR The towns of Cripple Creek and Victor sprang up after a cowboy called “Crazy Bob” Womack discovered gold in a cow pasture in the caldera of an ancient volcano on the western side of Pike's Peak in 1890, the gold believed to have been sent to the surface from the earth's core by the volcano's erruption. 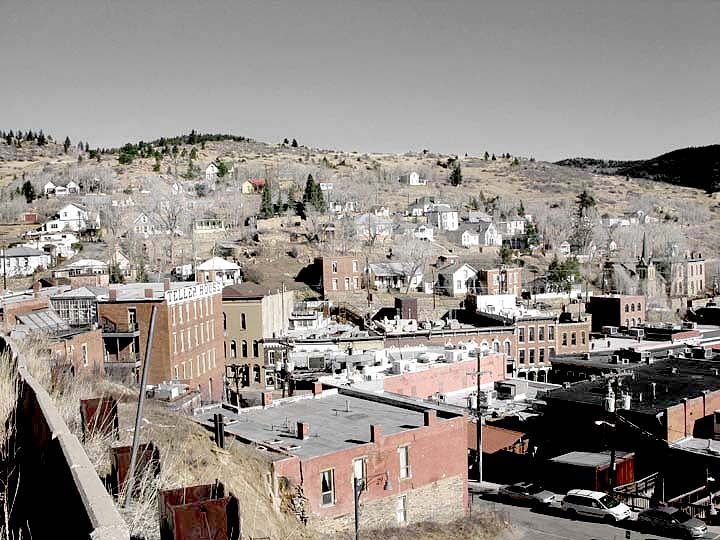 (Cripple Creek took its name from when a calf broke its leg while jumping over a creek after being startled by the commotion when two of the first residents of the area injured a hand and a leg!) The area grew so quickly and produced so much gold that it became known as “The World's Greatest Gold Camp” with over 500 registered mines (in fact, the Cripple Creek District - which included Victor - was the 5th largest in the world). The district produced more than 21 millionaires by 1900, at the old gold price of $18 an ounce. Today, with gold at or over $1500 an ounce, these men would be billionaires, and the total value of the Cripple Creek District gold would be around $29 billion. The mines of the Cripple Creek District were served by four railroads (although the names changed several times), two narrow gauge and two standard, and two electric trolleys (the "Low Line" and the "High Line"). 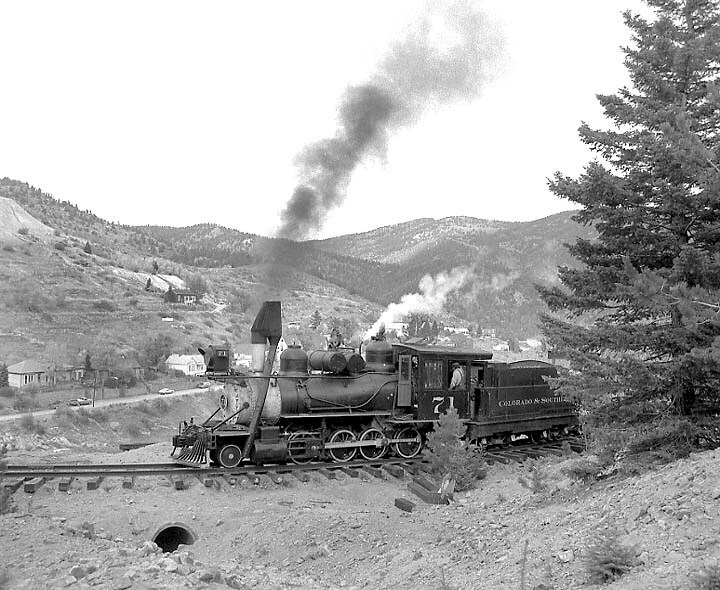 Between 1894 and 1919, the narrow gauge Florence and Cripple Creek (nicknamed "The Gold Belt Line" and also the "String Line" as its winding trackage resembled a dropped piece of string), which built north via the narrow Phantom Canyon 40 miles into Victor from a connection with the Denver & Rio Grande RR in Florence and Cañon City, served many of the mines in the district. 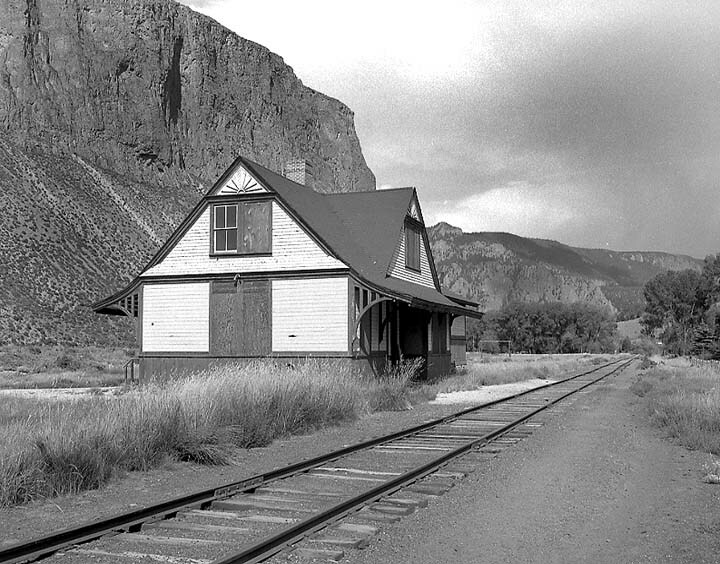 After the railroad’s line in Phantom Canyon was washed out by a flash flood, the F&CC was abandoned. The second narrow gauge line, the Golden Circle RR (later renamed the Cripple Creek and Colorado Springs RR), in 1896 took over part of the F&CC’s lines in the district and operated until 1919, with its last two years of operation converted to standard gauge. 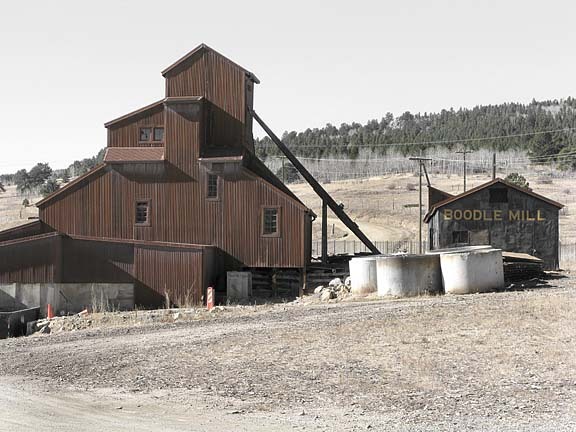 The impressive Mollie Kathleen Mine ore house (above) still stands at the southern edge of Cripple Creek, the mine today open for guided tours 1000 feet underground; and one of the electric trolleys (left) that served Cripple Creek and Victor is on display in downtown Victor. 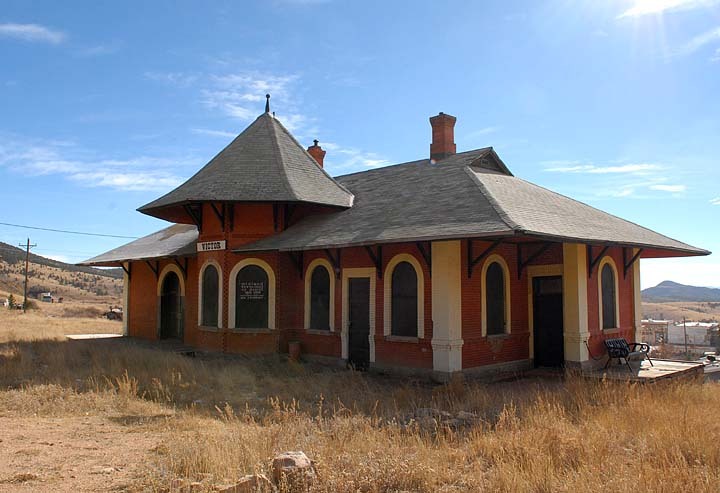 Between 1894 and 1949, the standard gauge Midland Terminal Railway, building south 30 miles from the Colorado Midland RR in Divide, also served the district. And between 1901 and 1920 the Colorado Springs and Cripple Creek District Railway, AKA the "Short Line," ran for 46 miles up today’s Gold Camp Road, the most direct route into the district (the shorter Midland Terminal's actual distance to the Springs was 55 miles including its connection with the Colorado Midland). 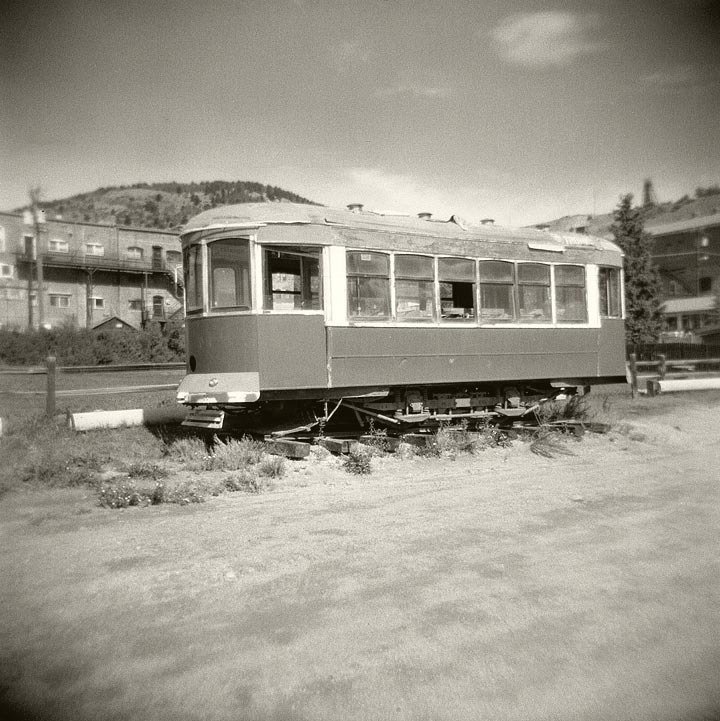 The CS&CCD also operated one of the electric trolley commuter lines between Cripple Creek and Victor. At the district's peak, as many as 50+ trains a day ran from Colorado Springs and Canon City hauling the rich mine ores and passengers, and the area population was about 60,000. 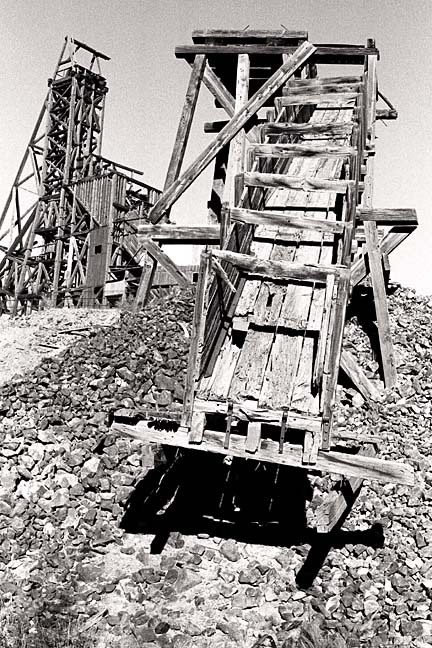 But By 1962, most of the mining activity had played out and the population was down to about 1,800. 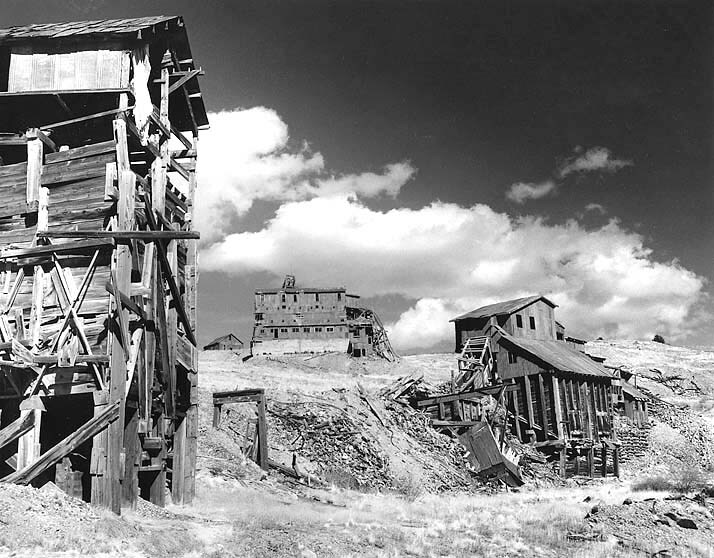 The Cripple Creek & Victor Gold Mining Company formed in 1976 operates the Cresson Mine above Victor, the largest surface gold mine in Colorado, and the town of Cripple Creek has also revived with legal gambling (along with Central City and Black Hawk to the north). Today, the 2 foot 2 inch gauge Cripple Creek & Victor RR runs over a short section of the old Florence & Cripple Creek and Midland Terminal grades. 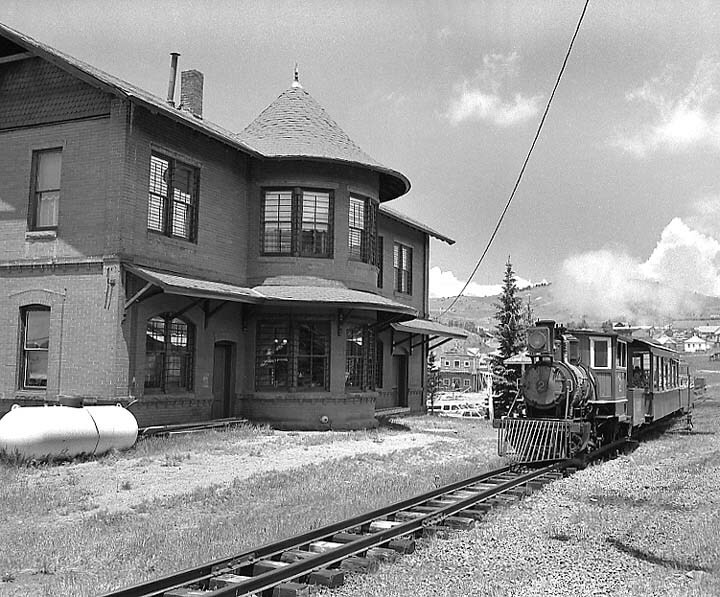 Daily during the summer tourist season, two of the line's four little coal burning steam locomotives, Cripple Creek & Victor RR #2 seen here passing the Midland Terminal Cripple Creek depot building, now a museum, carry passengers past many old mine sites between Cripple Creek and the site of the old mining town of Anaconda, which burned in 1904 and was never rebuilt. A smaller depot building used by the CC&VRR in Cripple Creek today was originally the Midland Terminal's Anaconda depot built in 1894. 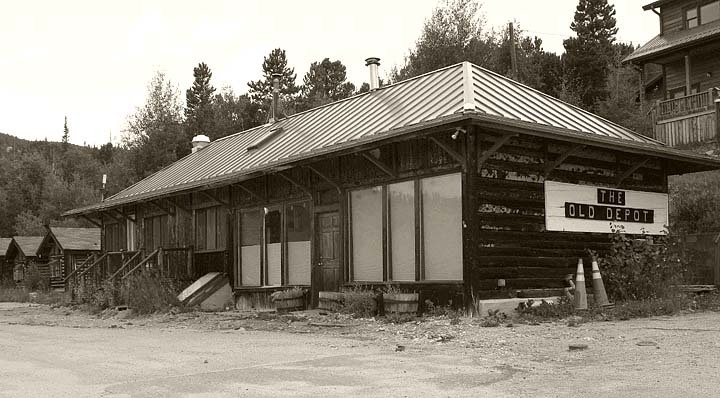 After the fire, the depot was moved to Bull Hill north of Victor in 1912, then finally to its present location in 1968. Also on the CC&VRR property is a Midland Terminal baggage car and passenger coach, and another Midland Terminal coach beside the CC&VRR depot serves as the Cripple Creek visitor center. CC&VRR #1 is a 1902 Orenstein and Koppel 0-4-4-0 articulated Mallet. #2, seen here passing the old Midland Terminal station (now a museum) in Cripple Creek is a German 1936 Henschel 0-4-0; #3 is a 1927 Porter 0-4-0 tank engine; and #4 is a 1947 Bagnall 0-4-4-0T. #1s and 2 have an indirect link to Colorado mining, having previously served in a Climax Molybdenum Company mine in Mexico. 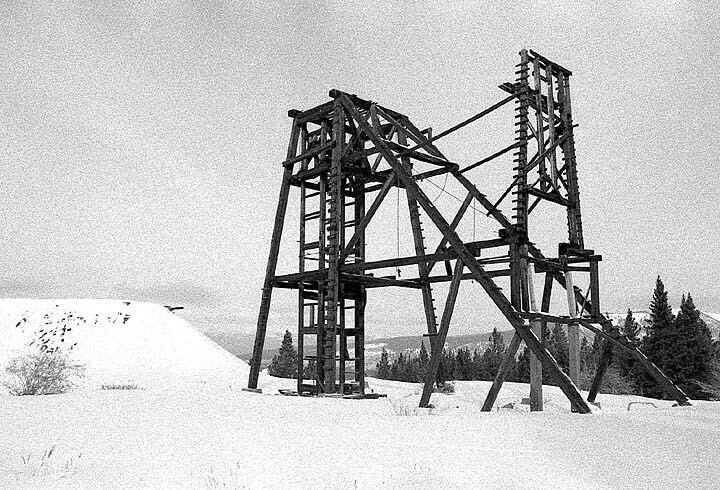 Climax also operates a Molybdenum mine atop Climax Pass above Leadville on the old Denver, South Park & Pacific line. 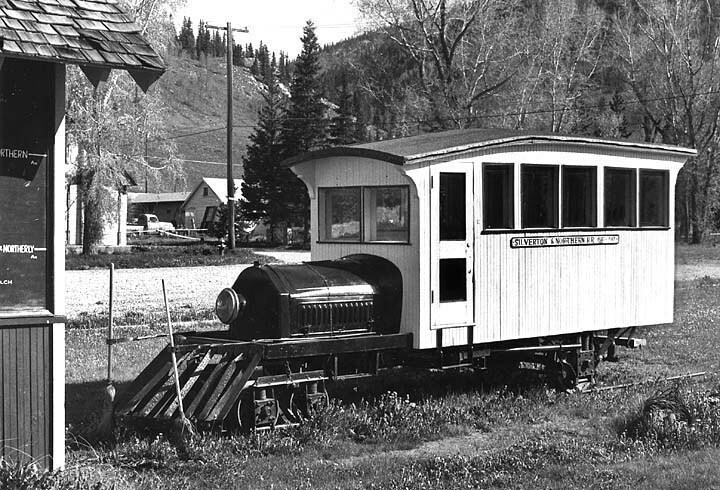 The CC&V also owns a 1951 General Electric diesel-electric, previously used as a battery powered mine locomotive at the Idarado Mine near Telluride. Built in 1899, until 1916 Rio Grande Southern #20 was the Florence & Cripple Creek "Portland," after a mine in the Cripple Creek District. Today it resides at the Colorado Railroad Museum. 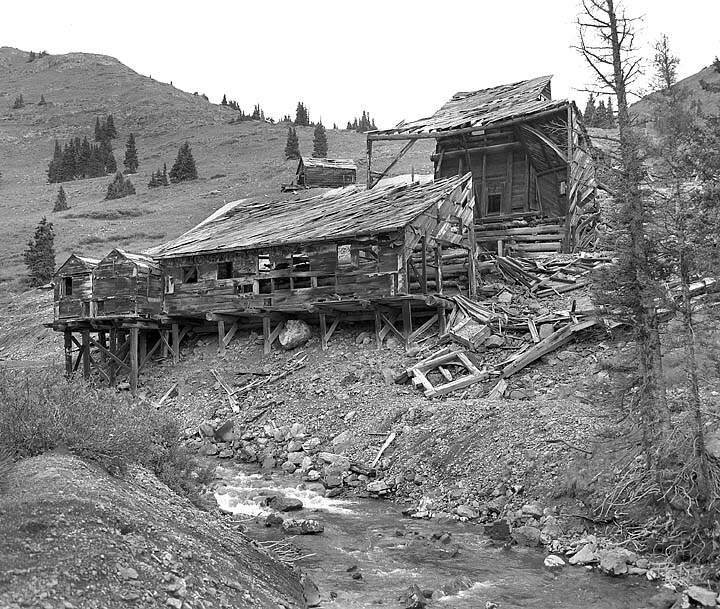 From the Anaconda town site about halfway between Cripple Creek and Victor, riders on the Cripple Creek & Victor RR can see the aptly named Chicken Hawk Mine (left) perched high on a ridge slope, along with this old blacksmith shop at Anaconda above Highway 67. This and some huge cribbing just to the right of this photo across Squaw Gulch is about all that is left of the town of Anaconda in the gulch below. The old grade in the foreground, originally the Midland Terminal's, was untill recently used by the CC&V which turned on a wye here to return to Cripple Creek. One wonders if the growing mine dumps of the Cripple Creek & Victor Gold Mining Company seen in the background approaching this site are the reason for the track's removal? 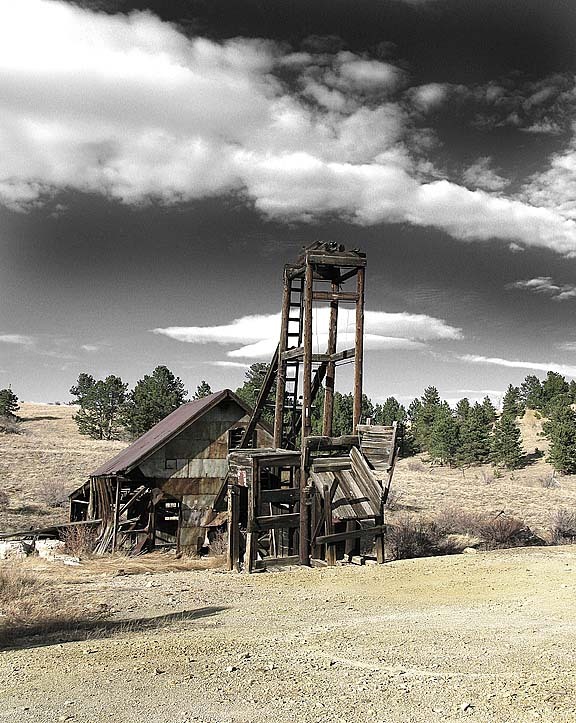 Up the road from Anaconda, old Victor sits at the foot of Battle Mountain, a huge area filled with mines. One of the richest was the Independence at the edge of Victor which made Winfield Scott Stratton (who worked as a carpenter in Colorado Springs to finance his summer prospecting activities) one of the early mining millionaires in Colorado. 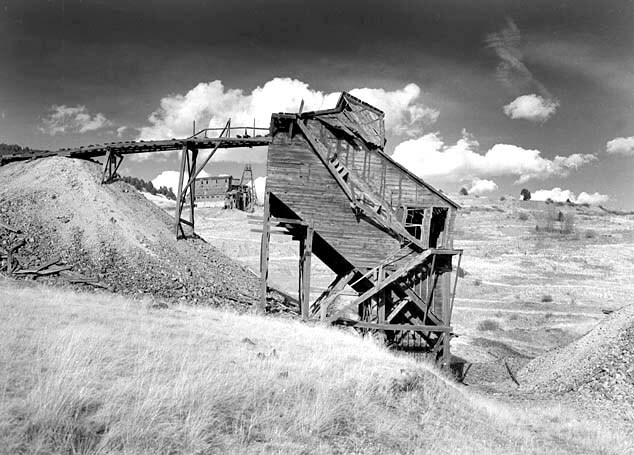 The mine gets its name from being discovered on July 4, 1891. And the Midland Terminal depot still stands in Victor at the corner of Granite Ave. & 4th St. 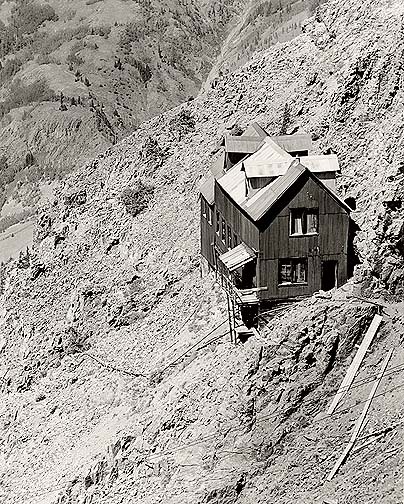 The Strong Mine is right at the north edge of Victor, just below the Independence; and the impressive Theresa Mine shaft house stands in a commanding location on Battle Mountain with a backdrop of the Sangre de Cristo (Blood of Christ) Mountains to the west. Also in the distance, the Independence Mine head frame can be seen. "May You Stand in Ore and Your Labors Be in Vein"
reads a Cornish miner saying on a sign near the Theresa mine. The huge Vindicator ore house and mill (left) on Battle Mountain. 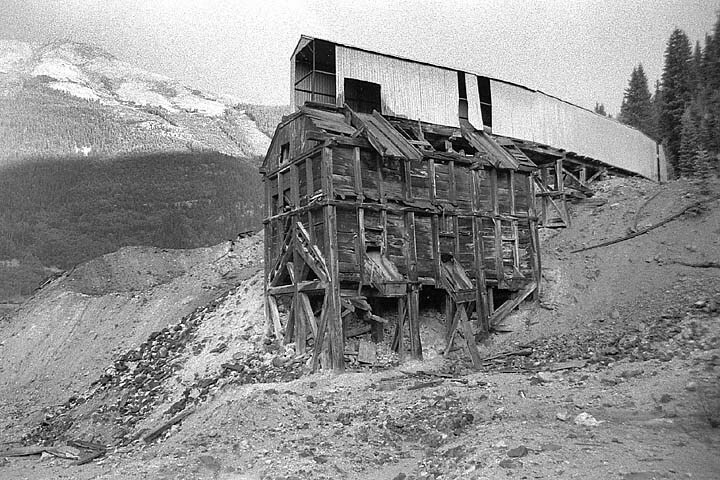 The two structures in the foreground of the previous photo can be seen down past the Vindicator in the background; and the Long Mine ore house (right) still stands on Battle Mountain, with the railroad grade still visible at the right (although the little "cupola" atop the structure fell the winter after this photo was taken in 1998). A photogenic ore sorting house below the Vindicator, beside the railroad grade; and a nostalgic and once elegant passenger coach in a field near the Theresa and Vindicator mines. Highway 67, following part of the old Midland Terminal grade from Divide, bypasses this Midland Terminal tunnel north of Cripple Creek. 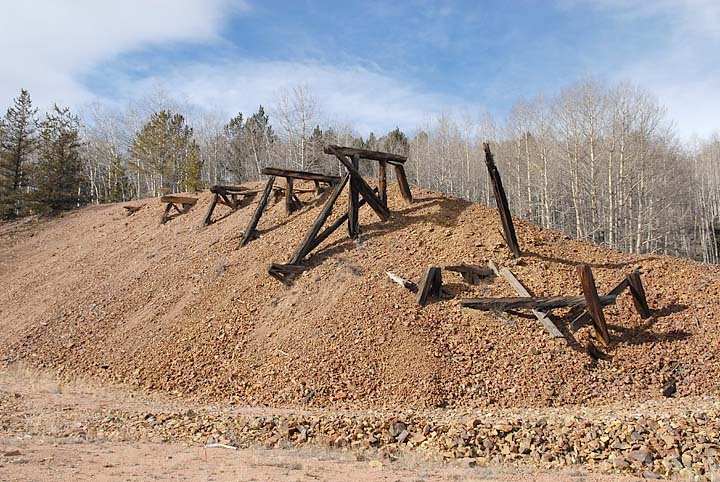 And this trestle on the abandoned grade of the Colorado Springs & Cripple Creek District RR beside Rd 81 outside Victor shows a typical railroad building practice of 100+ years ago. Often, it was quicker and cheaper to build a trestle then later create a fill covering the trestle, as well as a way to fire proof a wooden trestle. The CS&CCDRR utilized several filled in trestles on its route. From Fairplay, the railroad extended its line on north and west another 12 miles to serve the mines around Alma, including the North London Mine (above left). 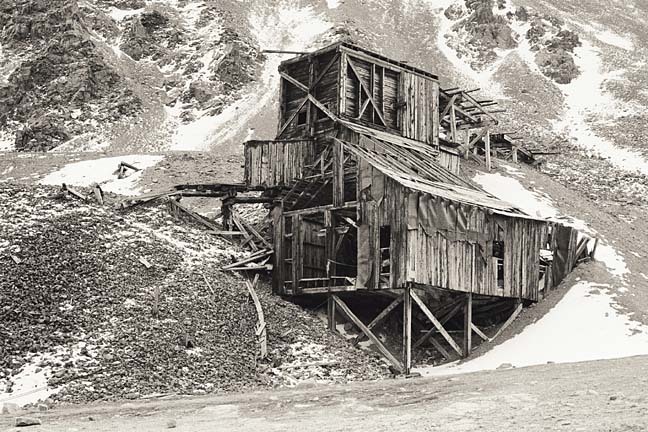 The railroad only went to the North London's huge ore processing mill in the Mosquito Creek Valley - this ore house of the North London is higher up near the top of Mosquito Pass. (The “Mosquito” name supposedly comes from a mosquito that was found smashed between the pages of a book where the minutes of meetings were recorded.) And these ruins of the Leavick Mill (above right) still stand along a branch of the DSP&P grade (now a county road) southwest of Fairplay. St. Elmo dates from the 1870s, growing out of a mining camp into an incorporated town of as many as 3,000 residents in the 1880s. St. Elmo also served as a railroad supply town and base of operations for Denver South Park & Pacific RR men working on the line through the Alpine Tunnel. After the closure of the tunnel in 1910, the railroad still continued to serve the mines above the town. 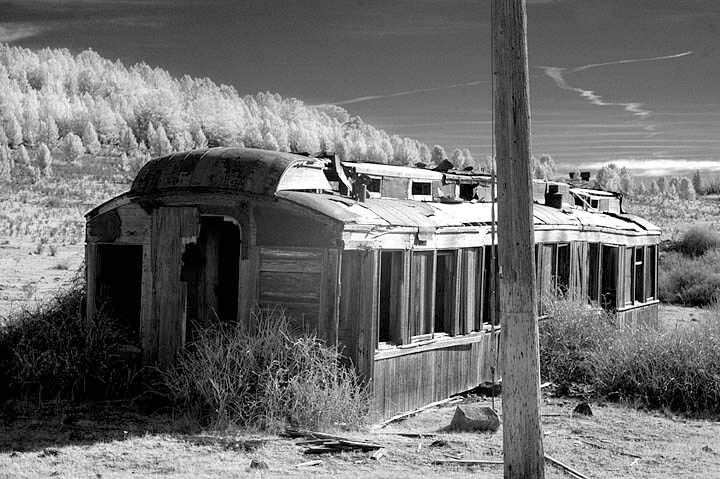 But in 1926, the rails were torn out after the last mines had played out, and by the 1950s St. Elmo claimed only a handful of residents and was nothing more than a dying - if very scenic - ghost town. In 2002, half of St. Elmo’s main street burned, including the historic town hall and wooden phone booth that President Theodore Roosevelt is said to have once used. Fortunately, the Stark store (above right) and other buildings just across the street were saved, and the town hall has since been rebuilt. The Mary Murphy was served by the Denver, South Park & Pacific. The Mary's impressive tram house still stands, along with a well preserved boarding house and a few other ruins, including an interesting “open air” 2-holer! This structure housed the tram machinery that transported the Mary Murphy's ore down the hill about 3/4 of a mile to the DSP&P railroad at the old town of Romely, about 2 1/2 miles up the grade from St. Elmo. Although looking like it will collapse on itself at amy moment, it has been in this condition for many years. And this well preserved wooden tram engine sits in the trees to the east of the road up to the Mary Murphy. 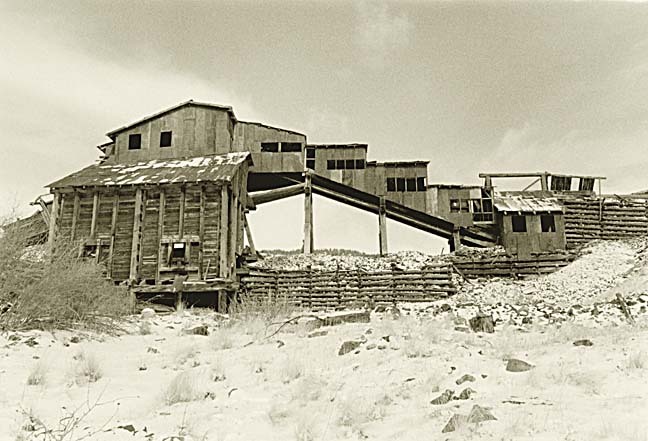 Legend has it that the Mary Murphy mine was named for a Denver nurse who cared for a prospector and he promised to name his mine after her if he found gold. 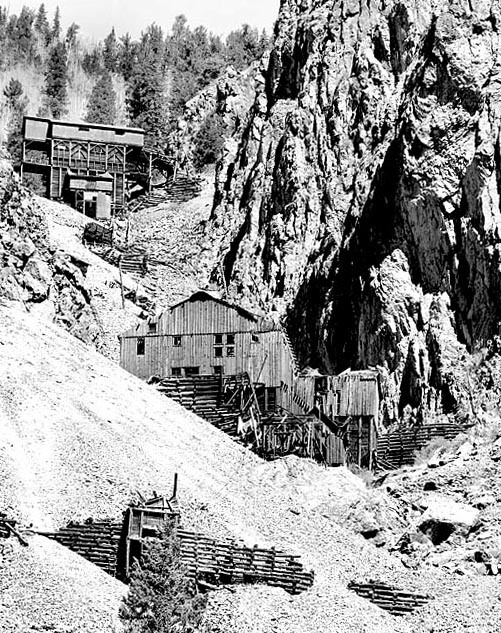 By 1881 the Mary Murphy was one of the the richest mines in the “Alpine” mining district, whose mines produced over $14,000,000 in gold (at about $20 an ounce). 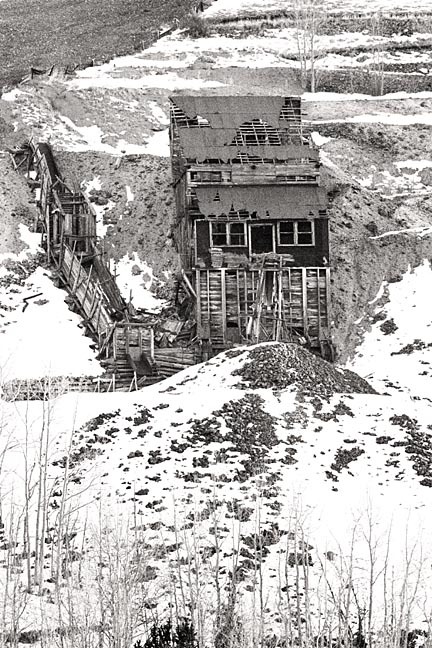 For decades the collapsed Allie Bell Mine building has been in this position beside the old Denver, South Park and Pacific grade above St Elmo, between the old town sites of Romely and Hancock. 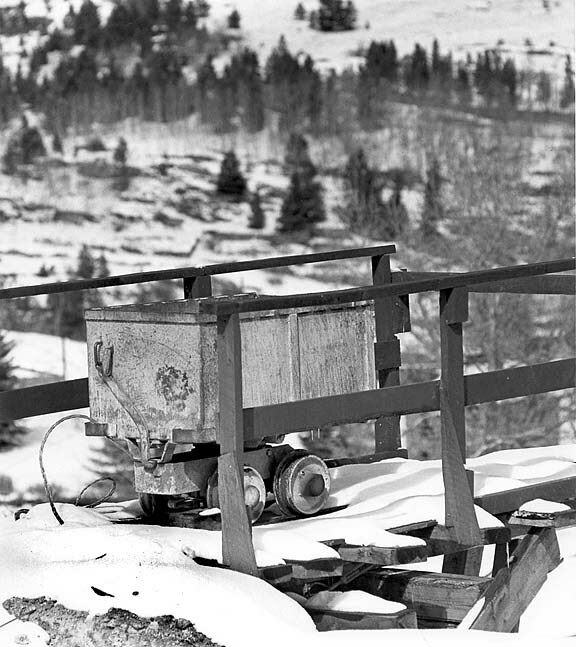 Placer gold was discovered in California Gulch in 1860 near present-day Leadville. But the gold boom was brief, with the mining hampered by heavy brown sand in the sluice boxes. It would be another decade and a half before the miners discovered that this sand was in fact lead carbonate from which comes silver. 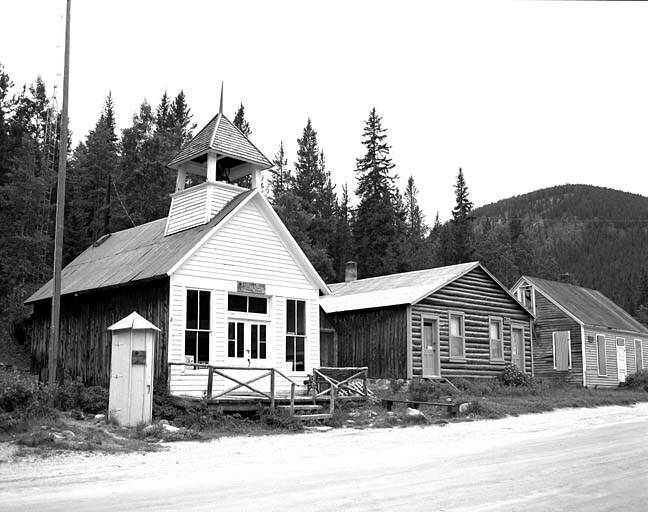 By 1880, Leadville was a huge silver camp with a population swelled to over 40,000. Horace Tabor is old Leadville’s most famous resident. 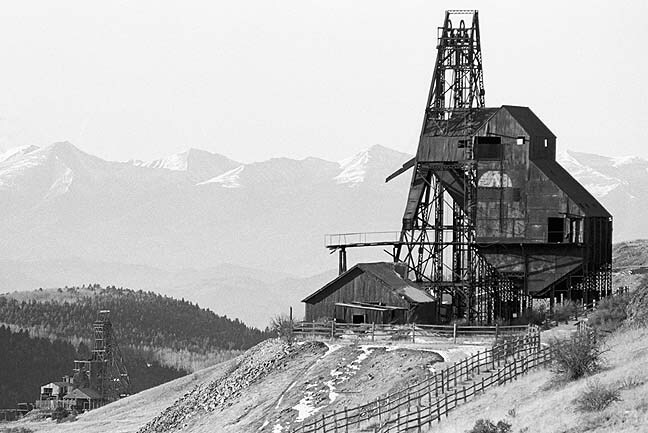 His discovery of the Little Pittsburgh started the Leadville silver boom and made him a millionaire, and he also owned the very profitable Matchless Mine which is still open for tours. Horace created a major scandal for the time when he left his wife of 26 years to marry the much younger Elizabeth “Baby Doe” McCourt. Tabor later lost his fortune, and his widow Baby Doe died a pauper in 1935 in a cabin at the Matchless Mine. 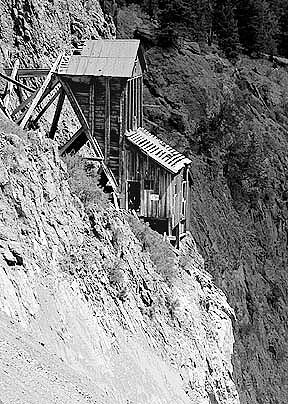 The Little Johnny Mine (above left) was owned by James Brown, the husband of "the Unsinkable Molly Brown" of Titanic fame. 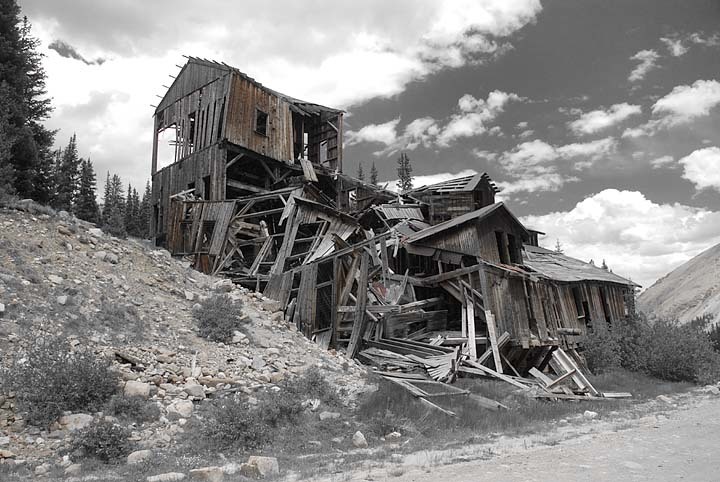 The 1893 repeal of the Sherman Silver Purchase Act (which had required the Federal Government to buy all silver produced) pretty well killed the Leadville boom, although mining for gold as well as other minor metals continued. All together, the district produced over three million troy ounces of gold, 240 million troy ounces of silver, one million tons of lead, 785 thousand tons of zinc, and 53 thousand tons of copper. 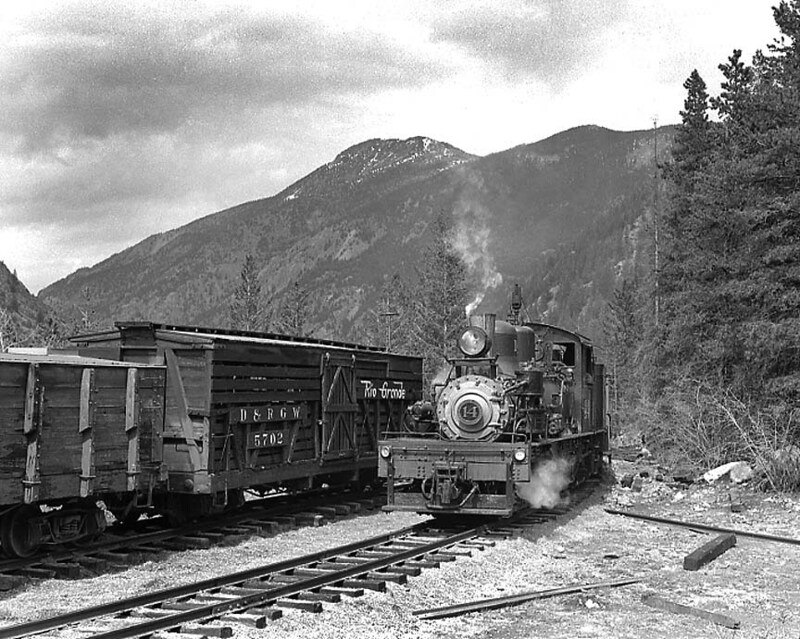 Two narrow gauge railroads served the Leadville area. The Denver & Rio Grande reached town in 1880 via their line from Pueblo through the Royal Gorge of the Arkansas River, which was extended on past Leadville over Tennessee Pass to Utah. And the Denver, South Park & Pacific reached Leadville in 1884 via a round about route from South Park crossing Boreas Pass into the Blue River Valley, then over Fremont Pass into town. 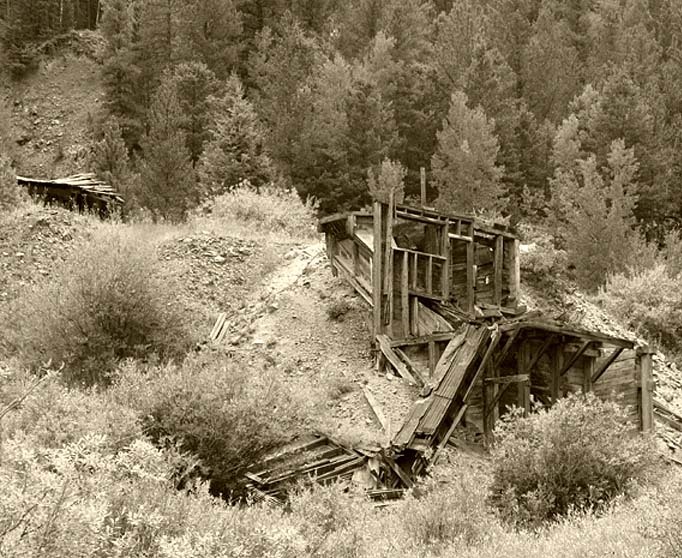 In 1946, the portion of the DSP&P line over Fremont Pass that was left in place when the DSP&P pulled out was standard gauged to connect with the Denver & Rio Grande Western in Leadville to ship the ores from the Climax Molybdenum mine. Today this line serves as the route of the Leadville, Colorado & Southern summer tourist line. The Denver & Rio Grande's narrow gauge rails reached creede in 1891. 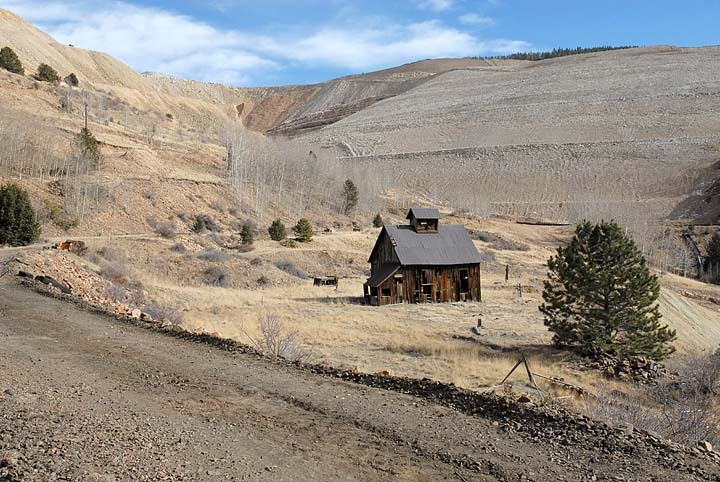 The Commodore Mine complex of four mine buildings above Creede was served by the Denver & Rio Grande. Bob Ford, the back shooter of Jesse James, owned a saloon in Creede until he too was murdered. To this day there is a grave above Creede with a cleverly worded sign implying that this is where Bob Ford is buried. However, Ford's body was disinterred soon after his death by relatives and reburied back in his home state of Missouri. To save redigging another grave in the hard rock filled ground, an outlaw who had just been hanged was placed in Ford's grave. The town streets were lit with bright flares all night long, giving rise to this popular line from a poem by Creede’s newspaper editor Cy Warman: "And there is no night in Creede". The station at Wagon Wheel Gap still stands beside the now unused tracks (standard gauged in 1902) on the Rio Grande's Creede branch. Taking off from its main line at Poncha Junction west of Salida, between 1881 and 1883 the Denver & Rio Grande’s narrow gauge Monarch Branch was built about 16 miles west to the Colorado Fuel & Iron Company’s Monarch Limestone Quarry on the eastern slope of Monarch Pass to supply limestone to its steel mill at Pueblo. The final climb to the quarry used a double switchback on a 4 1/2% grade to reach the quarry at 10,090 feet. 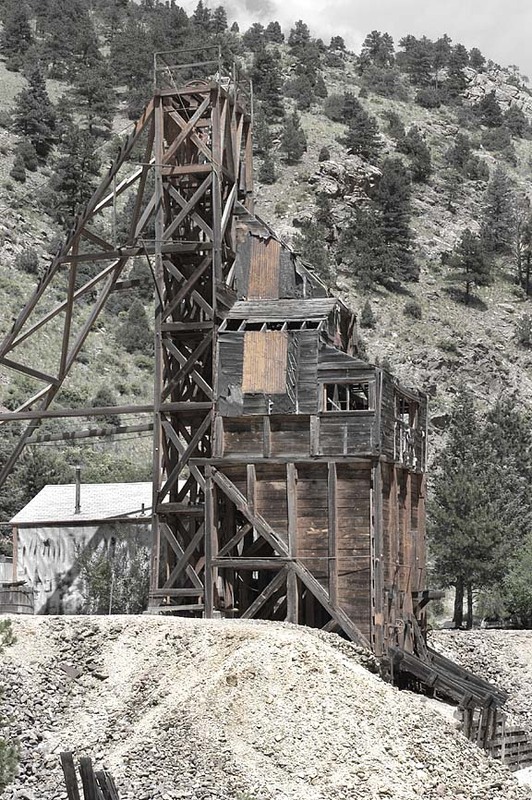 The Monarch mine was originally the Madonna mine started when silver ore was discovered here in 1878. 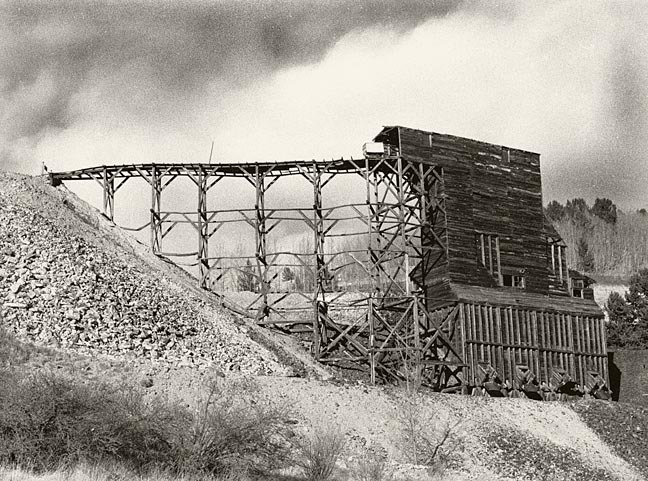 Up to 30 carloads of ore were hauled daily to the smelter in Pueblo. 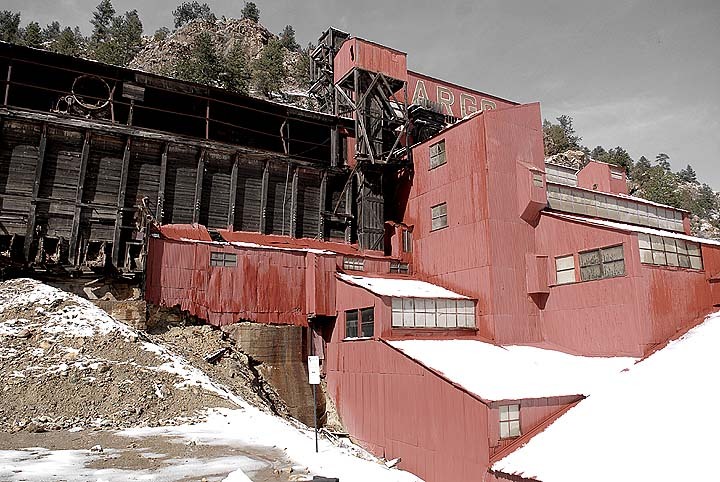 The line was standard gauged in 1956 and finally abandoned in 1982 when the Colorado Fuel & Iron mill closed. But the large and impressive tipple that sorted the limestone still remains at the quarry, south of and below HY 50 over Monarch Pass, where some mining has resumed.